For Japanese people it might be obvious and easy how to write Japanese documents in LaTeX, and there are many pages (in Japanese) explaining details. But for the foreigner who is able to read and write a bit (especially with the computer), and needs to prepare handouts or slides in Japanese (like I have to do for my lectures), the mystery of writing Japanese text, with mathematics, and mixed with Roman letter text, is a big hurdle, especially since there are so many different options. I am setting off to write down my limited knowledge on how to write documents containing Japanese, based on my own experience and help from many friends here in Japan. This first part introduces the various writing systems in use in Japan, the TeX engines and packages that can be used to typeset Japanese text, and a list of features. I finish with a very personal comparison of the options. Katakana カタカナ: Absolutely parallel to the Hiragana, but the form is a bit more squarish. Used for foreign words. Kanji 日本文化: iconographic characters imported from China. Make up most of the words written. Typesetting in Japanese is governed by a long list of rules. A good explanation can be found in this article by Haruhiko Okumura (奥村 晴彦). Very detailed and extensive documentation can be found at this W3C Working Group Note (although you need quite some time to read through all of it!). TeX by itself does not provide support for all the particularities of the Japanese writing conventions, so in 1987 Yasuki Saito (斉藤 康己) from NTT set out to create NTT jTeX, and three years later in 1990, Shunji Ohno (大野 俊治) and Ryoichi Kurasawa (倉沢 良一) from the ASCII Corporation added vertical typesetting capabilities, necessary for the needs of Japanese publishers. pTeX, or Publishing TeX, was born. More details can be found in the already mentioned article of Okumura-sensei. There are a few other options on CTAN, especially zhmCJK, but it isn’t in TeX Live, and I had a hard time setting it up, so I cannot comment on it. As mentioned above, the rules for typesetting Japanese are quite intricated. LaTeX typo vertical utf8 comm. Selecting the “right” option is a non-trivial thing. 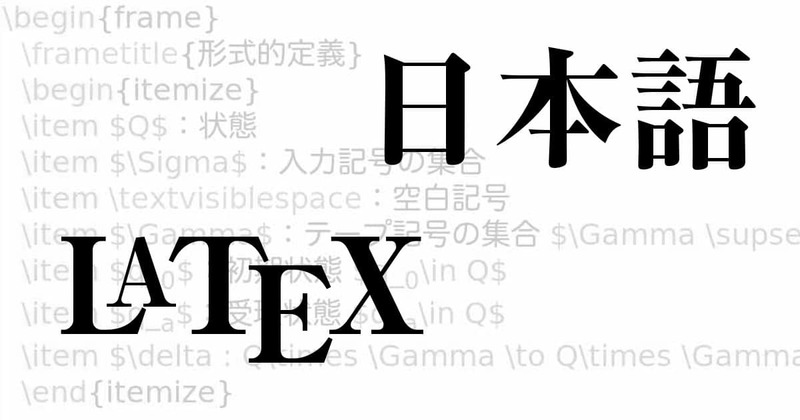 For my first steps I have used pdflatex/CJK, and then (u)ptex. Then, since I had to make slides using tikz etc, I switched to pdflatex/bxcjkjatype. Recently I am converting all my documents to luatexja, as it provides the best mix of features for me. (u)ptex: There are two advantages of this group of engines: One is that they support vertical typesetting. And in fact, if you need vertical typesetting, there is no other way to go then one of them. The other advantage is that these engines are the original implementation and closest to the typographic standard of Japan. Unfortunately, there is no development going on for ptex, while uptex at least has small changes. The big disadvantage of this group of engines is that it is based on old code, so it cannot produce pdf directly, nor supports lots of different graphic formats. pdftex/bxcjkjatype has excellent features, works very well, without much setup, but has two disadvantages: One is that all non-ascii characters are treated as Kanji, which means you cannot type in characters like ö (for Gödel) as is, but have to write them as \"o, which I don’t like. The other disadvantage is a very particular one, linked to the way Kanjis are included from the fonts: I use Rikaichan a lot, a plugin for Firefox and Thunderbird, that allows translating from Japanese to English by moving the mouse pointer over a text in the browser. No clicking, no copying, and even works with inflections. So I sometimes load pdfs into the browser (recent versions have pdf viewers built in), just to easily read complicated texts with lots of to me unknown kanjis. But this doesn’t work with bxcjkjatype, as the glyphs often come from different fonts (the thousands of glyphs necessary for Japanese are split into several different type1 fonts). luatexja: The absolute winner for me. As I normally don’t need vertical typesetting, it combines all the best features, and let me work like in a normal TeX document. Also the problems with Rikaichan are gone, tikz can be easily used, all graphics. My recommendation. In the next part I will take a simple Hello World document and prepare it for the different engines/packages, so that we see how to write the simplest documents. Thanks for any comments, suggestions, corrections, improvements. … when I rewrote the thesis proposal stylesheet for CS students at our all beloved University in Ishikawa I found pTex extremely difficult to set up and use. The main difficulty is to actually edit a document in Shi(f)t JIS (or was it EUC?). Emacs could handle it (of course), but I couldn’t get any of the fancy Tex-IDEs (i.e. Texmaker) working. thanks for your comment. Yes, this is a known problem. Fortunately, uptex can use UTF-8, and current ptex from TeX Live also accepts UTF-8 (by default on Unix, by command line switch on Windows). It is true that xelatex gives quick and easy results, but vertical writing is achieved by rotating the whole page (AFAIR). I will probably write one part on setting up various editors (emacs, texworks, texstudio maybe) to work for Japanese typesetting, too. Can you tell me how to get luatexja to recognize NotoSansCJK? I’ve just installed TexLive 2015, and I get gibberish when I try to use NotoSansCJK. I haven’t tried by now, and I’m traveling now, but will see what I can do when I’m back. Unfortunately not trival by now. There are some packages that can be found here: http://oku.edu.mie-u.ac.jp/~okumura/texwiki/?%E3%83%95%E3%82%A9%E3%83%B3%E3%83%88 but as far as I see they are not part of TeX Live by now. I guess that needs some time until this is worked out.